To shop for titles in a specific lending model, open the Shop drop-down menu in the upper-left corner of Marketplace. From here, you can choose between the lending models offered in Marketplace: One Copy/One User & Metered Access, Cost Per Circ, Simultaneous Use, and class sets (for schools only). Learn more about each lending model here. 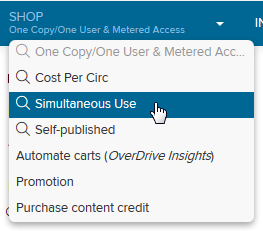 In addition to lending models, the Shop menu also contains other options and tools, like a section just for viewing self-published content, cart automation tools, and the ability to purchase content credit.